In Heaven's Child, A true story of family, friends, and strangers, Caroline Flhor describes the tragic death of her daughter, Sarah, in an automobile accident. She describes that moment we all are hardwired to fear - the knock on the door, the ring of the doorbell, the telegram, the middle of the night phone call - the sinking feeling we get when these things happen because we know that something terrible has happened - in her case, two local officials arriving at 5:30 the morning of August 23, 2003, and hearing the words of a firefighter saying words that can never be forgotten: "There's been an accident and Sarah has been killed." At that moment, Ms. Flhor's life, and those of her family members, changes forever. In a voice that is honest, pure, raw, full of feeling, she describes how she, her husband, her ex-husband, Sarah's grandparents, and each of the surviving children coped (or didn't) in the wake of this tragedy. Certainly time stood still for a while, and when the clock started to tick normally again, all was not right for a long time. This is a heart-wrenching but ultimately uplifting story of grief and how it changes and transforms us, if we will let it. Sarah was a twin, the mirror image of her sister Caiti, and she had three younger siblings, two of which were under two years old when she died. The grief and heartbreak of her death are told interspersed with the story of her life, parts of which are not revealed to her mother until she finds a personal narrative written by Sarah not too long before she died. Each chapter begins or ends with a timely, moving quotation from a poet or author, quotations carefully chosen and perfectly inserted into Ms. Flhor's personal narrative. This book was very, very difficult for me to read, because there was a Sarah in my life who died tragically at the age of 18 in a freak automobile accident, fifteen years ago, and every time I read "Sarah" I was catapulted back to the time of my own grief. One of the beautiful quotations in the book is from Thornton Wilder's "Our Town," which was the last play "my" Sarah performed in when in high school. Chills ran up my spine and goosebumps rose on my skin when I read that. 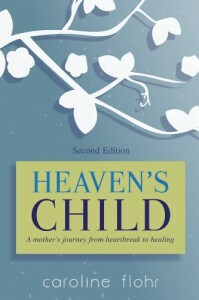 When I finished Heaven's Child, I was so overcome that I had to take to my bed, and when I woke up, I burst into tears. 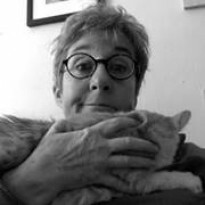 While I was overcome by the constant reminders of the Sarah I knew, I think I was even more overcome by the brilliantly written, brutally honest, story that Caroline Flhor tells. Even without a similar personal loss, I think this story would do that to any reader. Ms. Flhor is a gifted writer, and she tells a story that any parent, anyone who has ever loved and lost anyone, can relate to. The circumstances of loss are not what matter: death is a universal truth that touches us all in many ways, and this moving, bluntly honest, story will touch the heart of every reader. I entered the Goodreads giveaway for this book but did not win; Ms. Flhor graciously asked me to read it in exchange for a review. I am so glad that I met her and her family.